the birth and christening of Prince George Alexander Louis. 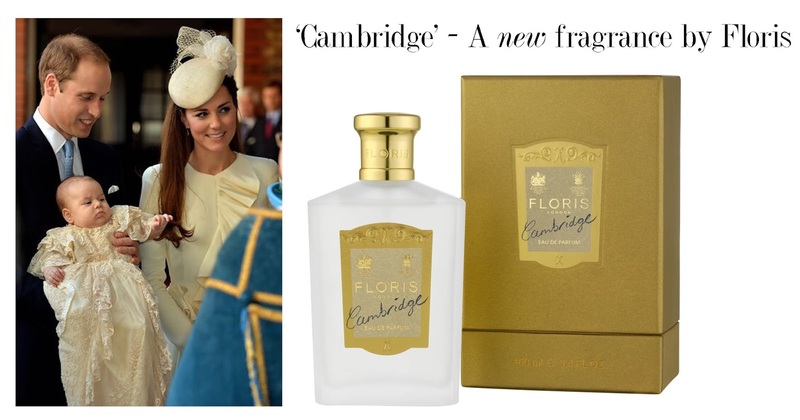 The Eau de Parfum, ‘Cambridge’ is a clean, fresh marine, woody fragrance with a modern amber base. The fragrance was inspired by the array of aromatic ideas penned by customers on the pages of the By Request books or posted to Jermyn Street by email. The Floris Perfumer began an olfactory journey to lift these emotive words into scent. With topnotes of Bergamot, Galbanum, Juniper Berry and Marine the fragrance travels through to the heart notes of jasmine and lavender, warmed with cedarwood and fir balsam. The rich base of the fragrance is balanced with modern ambers, musks and a hint of vanilla. Catherine, The Duchess of Cambridge, certainly wowed in the style stakes, wearing a sophisticated cream Alexander McQueen ensemble finished with a matching pillbox hat by Jane Taylor Millinery. Congratulations to The Duke and Duchess of Cambridge and to all the Royal Family.